One of the most important spiritual experiences you can have is the merging with your Holy Guardian Angel. Your HGA is an esoteric term that refers to the highest human self that has completed all your incarnations and has learned all the human lessons. This self exists in the spirit plane to maintain your spiritual connection. It is like a bookmark of yourself that has not disconnected from spirit. The goal of the spiritual adept is to cross the Abyss into Kether and then to merge with his/her HGA. 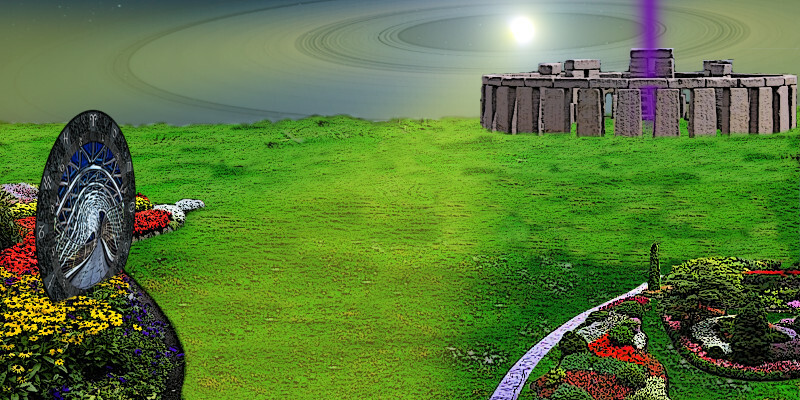 The merging with your HGA happens at Stonehenge Garden located in Kether. It is accessible from Stonehenge Campground’s Gateway Portal into Kether. If this is your first trip, travel to Stonehenge Campground. Then go through the Gateway on the other side of the Stonehenge monument, opposite the campground tent. If you meet with Khronozon, make note of anything he tells you for later. Exit the Gateway at Stonehenge Garden (you are now in Kether) and walk to the Stonehenge monument that is here. In the center of Stonehenge, you will see a violet flame descending into a bath with a golden liquid in it. Stand in the bath to begin the quest. The HGA merging is the first step toward merging with your Soul. The spiritual hierarchy of the self from top to bottom is: Monad, Soul, HGA. So, the HGA is the first of several mergings with divinity that you will be having in Kether. Kether serves two very important purposes. One, it is a doorway to other realities, places, planets, and star systems. Two, it provides the means for you to spiritually grow into a divine being, merge with your divinity, and then pass through the ascension gate and ascend to a higher level of being. The main quest is to merge with your HGA. This merging will happen gradually over time. You will need to revisit here and blend with the HGA energies until the merging is complete. At the start of the merging, you will establish a permanent connection to divinity within you. You will also slowly gain the knowledge contained in this self that spans all your lives in time and space. When the merging is complete (or as complete as you can get while you are still within physical reality), you will have the awesome experience of seeing all your lives, past, present, and future, laid out one after the other and see the thread that you are weaving from one life to another. You will learn your main focus within time and space and why you are who you are and what you set out to accomplish. Even when the process is complete, you should visit with the HGA and reaffirm the link. As long as you are incarnated within time and space and inhabiting below the Abyss, there is always the danger of losing the connection to the HGA. So, every so often, come back here and merge with your HGA. The Druid here named Teskler can give you the talisman of ILIATAI (pronounced ee-lee-ah-tah-ee or ee-lee for short). It is connected with Kether and the unification with divinity. It means “to tread the highest path of wisdom is to unite with the god within yourself.” This talisman can help you when you feel your divinity slipping away because of some physical trial you are under and bolster your connection to the HGA. You will also find your “Pyramid of Divinity” here. Like your “Pyramid of Tomorrow” that helped you form the vision of your future through the lower part of the Tree of Life, this new pyramid holds a glimpse of your divine nature. As your divine nature grows, the pyramid will become more translucent. It is a symbol of how much your divinity has been revealed to you. When your “Pyramid of Divinity” is almost clear, you have achieved the highest possible merging with your HGA, congratulations! Check this pyramid every now and then and if it has become cloudy, it may be time for some additional HGA merging, to bring you back to the highest HGA vibration. 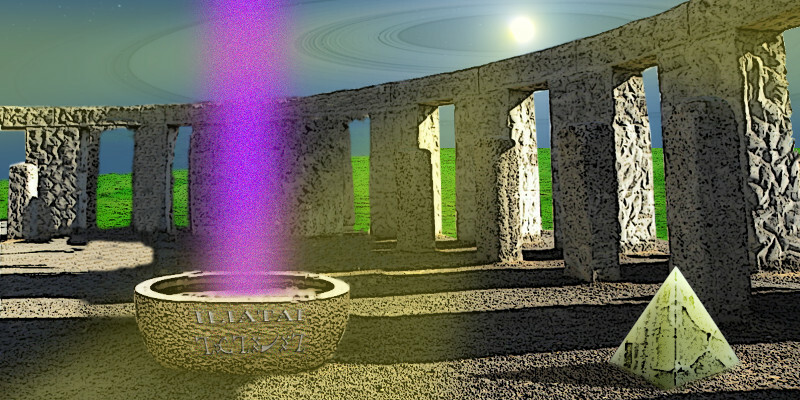 Earth Portal: Here in Stonehenge Garden there is a return portal that takes you back to earth. You may wonder what use this is when you just have to "pop" back into your body from your travel mediation or out of body adventure. Well, with travel meditation it is not a big deal, because not as much of your consciousness is out of the body during these, however, with out of body travel, Kether is very far from the earth plane. Returning to your body in an abrupt manner could leave some of your “astral stuff” out in the ether. It could be disorienting on return and may take time to collect this astral stuff back into you. By using the return portal, you do not have any of these side effects and make a clean transition back to your body. 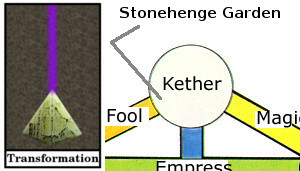 Use the “Earth Portal” anytime you are traveling in Kether and want to end your adventure. Note: your “Pyramid of Divinity” is shown here in its clear state of being (fully merged HGA). Primary Gift: Merging with your HGA. Secondary Gift: talisman of ILIATAI, to help keep your divine connection. Golden nugget: hold it when you need to help you keep the Kether vibration. 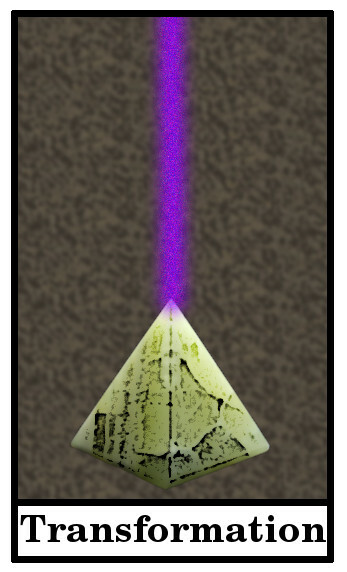 Pyramid of Divinity: shows you how much more you have to go to completely merge with your HGA and when you may need to reaffirm the connection. 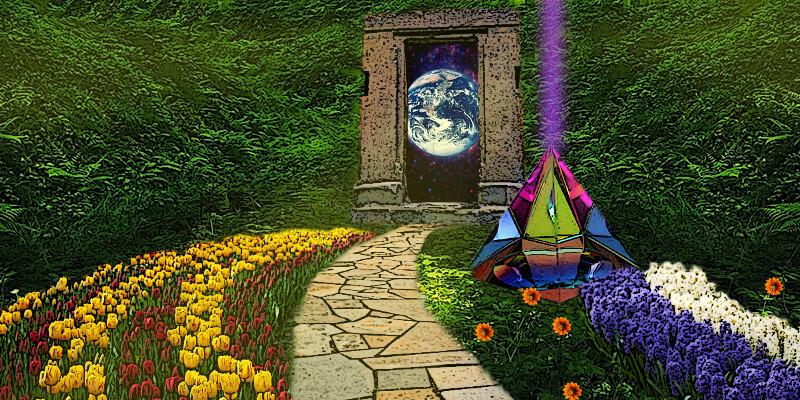 Earth Portal: optional return portal to take you right back to earth and your body.